It was exciting to witness a parallel landing at San Francisco International Airport recently. I was onboard a Delta flight when I noticed another aircraft close by. 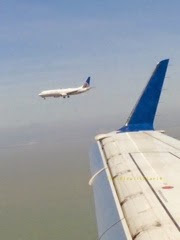 I watched our approach to SFO until we touched down together on parallel runways. Needless to say, the key to doing this successfully is for both aircrafts to keep their distance. I no longer dread waiting for hours for my flight after checking in at Manila’s Ninoy Aquino International Airport. I’m more worried that if I don’t check in early I’ll miss the chance of a good massage. Moreover, I’m preoccupied with the type of massage I’ll get: a one hour full body rubdown, a foot, back or scalp massage, or foot reflexology. The charge for a 20 minute back rub is $7.00 and my masseuse really worked hard on my aching back and shoulders and surprised me with a scalp massage to remove the fog in my head. She was also solicitous enough to ask me if her massage technique was hurting me. But I was already half asleep. Before finishing she asked me to sit down so she could stretch my back muscles and arms. What a clincher that was! True to the description given on their leaflet, the massage helped ease my anxieties. When we were done, I found I wanted more. But I had to board my flight to Tokyo.